Loan officers work for banks and other financial institutions, helping individuals and businesses obtain funds from these lenders. They investigate their creditworthiness, then authorize or recommend approval of loans. They might also deny a loan or advise against offering financing, and they must sometimes follow up on late payments on existing loans. Loans officers can specialize in commercial, consumer, or mortgage loans. Approximately 318,600 people worked in this profession in 2016. Find potential clients, individuals, or businesses who are in need of loans and cultivate their business. Meet with loan candidates to explain options and answer questions. Act as a salesperson, persuading clients to obtain loans from their institutions rather than anywhere else. 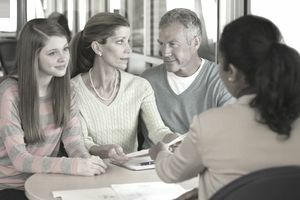 Help clients through the process of applying for loans. Analyze and verify loan applications to determine clients' creditworthiness. Ensure that loans meet federal and state standards and requirements. Loan officers' salaries can depend on their employers and the scope of their responsibilities. The most highly paid loan officers work for automobile dealerships. Some loan officers receive a salary, while others might receive salary plus commission on the loans they put into place. Occasionally, but rarely, they might only earn commission. Bonuses are common. This occupation requires some education, experience, and training. Education: You must generally have a bachelor's degree in finance, economics, or a related field to work as a loan officer. Licensure: There are currently no specific licensing requirements for loan officers working in banks or credit unions, but licensing requirements for loan officers who work in mortgage banks or brokerages can vary by state. They must generally have a Mortgage Loan Originator (MLO) license, however, which requires at least 20 hours of coursework and passing an exam, as well as a background check and a credit check. Training: Training is often—but not always—on the job. Some firms have dedicated training programs for new hires, and several banking associations offer training programs as well. You should have several essential qualities to succeed at becoming a loan officer. Computer proficiency: Job candidates for loan officer positions should be familiar with computers and software applications related to banking. Analytical skills and perception: You'll be required to accurately assess clients' financial statements to ensure their creditworthiness. Attention to detail: A successful loan involves many interlocking and sometimes minuscule details, and you can't overlook any of them. Salesmanship: The bottom line is that you're selling a product. You might have to persuade clients, as well as superior finance personnel to go along with your recommendations. Employment of loan officers is projected to increase a little faster than average for all occupations from 2016 through 2026, at about 11%. This field is heavily dependent on the current state of the economy, however, and growth can shift from field to field. For example, loan officers employed in commercial finance can only expect job growth of about 3% during the same decade, which is slower than average. Capable loan officers can move to larger branches of their firms or to managerial positions. Some might eventually supervise other loan officers and clerical staff. This is primarily an office job, but it can also depend on a loan officer's specialty. Those employed by mortgage lenders can expect to occasionally travel to meet with clients at their homes, and those employed by commercial lenders might be expected to visit businesses. This is a full-time position and can involve extensive additional hours over 40 per week. The pay of those who are paid on a commission basis can directly correlate with the number of hours they're willing to dedicate to work. Even when a college degree isn't technically required, those who have them or have extensive experience, even in a related field, have the best prospects. Some firms and institutions expect loan officers to build their own client bases, so applying with a list of contacts and network referrals can set you apart from other, less prepared candidates.